CAS now offers an online support portal where Workpro clients can securely log and monitor their technical support requirements 24/7/365. The portal offers the ability to log and track development and support requests, with a colour coded Issue List ensuring complete visibility of priority and status. The Billing dashboard allows clients to easily monitor performance against their SLA (service level agreement), for example a status bar shows at a glance how many support hours have been used and how many remain. The Reporting dashboard includes useful graphs and shows for example, number of issues raised, closed or currently open. Clients are able to communicate with us directly through the portal on each of the individual issues, allowing CAS team members to instantly refer to the issue in hand. Telephone and email contact continues as a complimentary option, and as ever the CAS team remains available for advice (advice requests can also be submitted via the portal). CAS is committed to providing great service, and we pride ourselves on our accessible, friendly and highly qualified team. The easy to use portal further increases transparency, communication and collaboration. 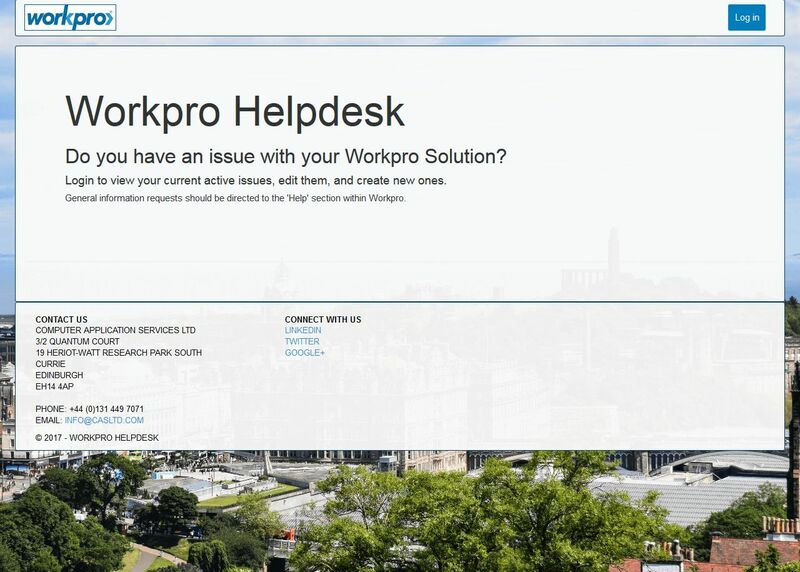 The portal is already in use by a number of Workpro clients, and comments so far show they appreciate the enhanced ability to track and monitor service requests, as well as the additional reporting available.